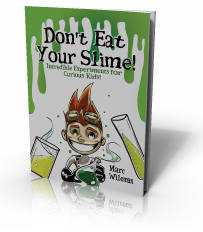 My lovely regular readers may remember that back in February I reviewed a free book download from award winning science party company Sublime Science. Well, I have randomly scored a job working for them. An advert was posted on the local Children's Centre Face Book wall for science communication presenters, and although I wasn't looking for work it just looked too perfect not to apply. Got an interview. Passed the interview. Now I'm raring to get going with training and getting my hands on the presenter kit full of brilliant gear with which to perform feats of scientific magic and hands-on experiences to fire the imagination of kids. I am ridiculously happy about being able to go to work in my lab coat again (I felt strangely under-dressed at the jobs I've had since being a Science Teacher). Sublime Science operates parties and events over a wide swath of the country (England), so if you want to book a party that's going to be that bit different from the usual discos and bouncy castles, be the talk of the playground for weeks, and even sneak in some learning that will get kids excited about science, then take a look at their website for details. If I wasn't going to be working for them I would book one for myself!